Today we're going to talk about the four things that your website Services Page must have in order to book more of your ideal clients. The reason we're talking about your Services Page today is because the majority of you have one on your website, but you have no clue how to make readers click “Book now”. 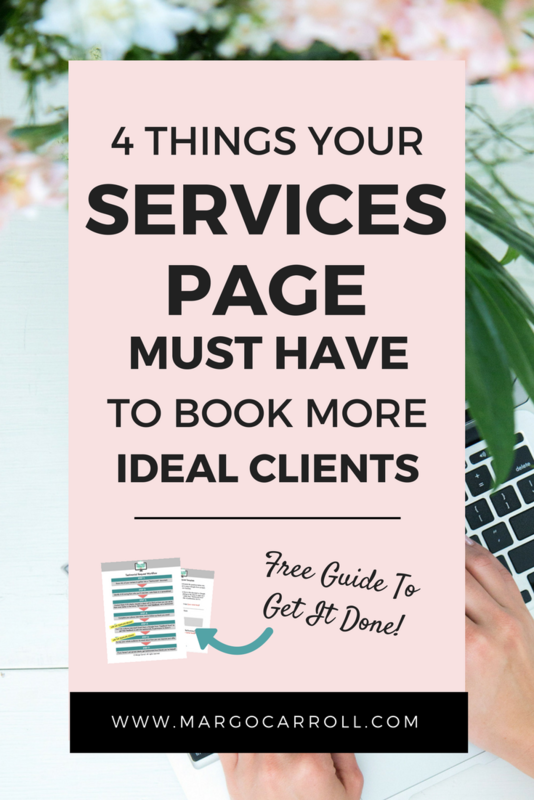 Well, there are four things that your Services Page needs if you want to book more of your ideal clients. You can follow along with this simple guide and plan out your exact content for your Services Page today! What Exactly Is a Website Services Page For? Generally speaking, this is going to be a page that outlines your offering (or offerings if you have more than one) for your ideal client. Some of my students and clients have both services and products that they offer on their website, while others have only services or only products. But the vast majority of the guys have told me that you do have a services page somewhere on your website (This might also be called your "Work with me" page). Now the reason why this is important to get right is that often this is one of the very first places people are going to go when they get to your website. That's because if they've actually clicked over to your website--whether that's from a blog post that you wrote or a Facebook ad that you're running--they're already interested in what you have to offer and so they're looking to find out more details about pricing and your unique value in the marketplace. So you have to do a super good job on your services page. You can't skip this over and just make it a bullet point list (While injecting more flavor into your Home page and your About page); your Services page needs to be infused with your personality and four key elements if you want to actually convert more readers into clients from your Services page. 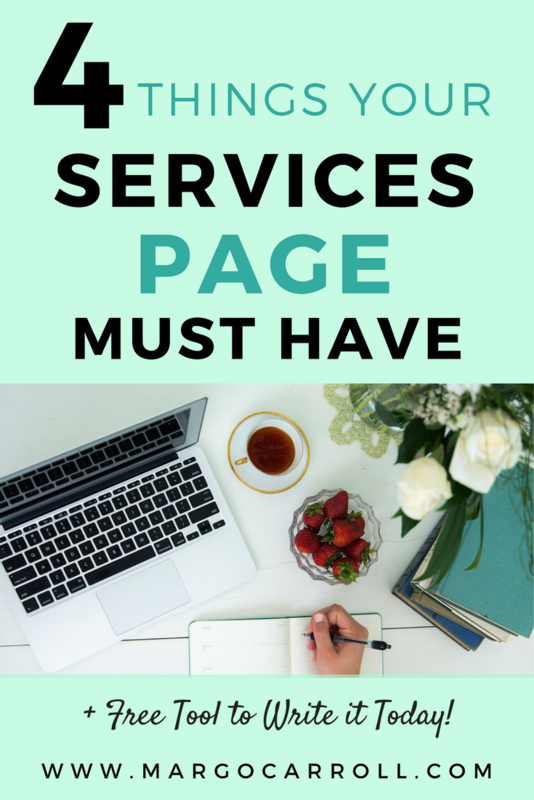 So let's dig in and talk about the four things that your Services page has to include if you want to book more of your ideal clients. Follow along: As we go through this list of four things that your services page needs we're going to be answering four key questions and that is what, how, who, and why. Let's start with number one which is explaining the "what." As soon as someone clicks over to your Services page you're going to want the copy on that page to very quickly answer for them (within about 3-5 seconds!) what it is that you offer. You need to clearly define your services and products, focusing on the benefits (rather than just the features). Nobody wants to just read a bullet point list of the types of work that you do and what the features of that work are (yawn!) --they want to know "what's in it for me?" as in, what are the benefits? How's this going to transform my life, my business, or my body by purchasing your offering? The second thing that you're going to need to have on your Services pages is the "how". That is, how is this service or product delivered? For example, maybe you have a group fitness coaching program and it's important for the client to understand that this is delivered primarily online or through group meetings via Zoom or Skype. Or maybe you have brick-and-mortar yoga studio and they need to understand where you're located and what supplies they need to bring to their first class. The unique method for delivering your offering here needs to be made clear because that's going to help the reader make a decision about if this is for them or not. The third thing that you need to include on your Services Page is "who." You need to make it abundantly clear on your website who you're targeting with your offering. If you like my website, margocarroll.com, you can see that I've made it very clear that the industry that I work with is wellness professionals. I'm not a copywriter and brand strategist for just anybody out there with any kind of small business. I do love working with all types of businesses and I have worked with a variety of them, but my favorite (and those that I'm more experienced with because I've worked with more of them) is working with small wellness professionals and entrepreneurs. "Is this geared towards me, or is it better that I look for someone else who is more specific to my needs?" The last thing that you're going to be clarifying on your Service Page is "why." Why is it that readers should book with you? This is probably the most important, and the one that I see people get wrong the most often on their Services Page. ...and then they totally neglect to say why it is that they're unique and the reader should book with them over somebody else that offers a similar service. Remember the marketplace is large whether you have a location-based or online business. There are many other people out there offering the exact same type of thing that you are. So it's your job to explain to this potential client (the reader!) what it is that sets you apart in the marketplace. Maybe you offer bonuses to the product or service that you offer that nobody else is offering. Maybe it's that you've been working in this industry longer than anyone else has, so you have a unique set of expertise. Basically you need to sell them on why they should choose you, and NOT just why they need this particular service. If they're just convinced about the service being valuable, well they can also go find it from someone else. So they need to understand why your offer is unique and more valuable than a similar offer elsewhere. 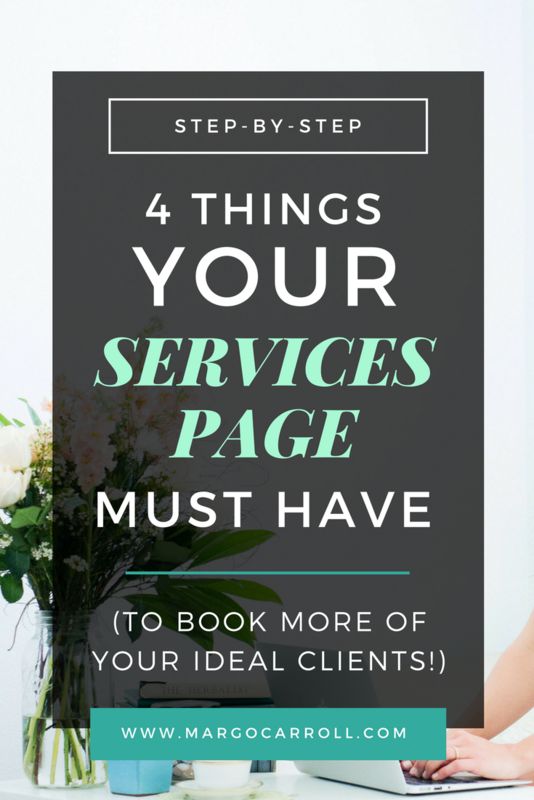 Alright, now you know the four things your services page must have in order to book more of your ideal clients! If you want to learn tricks to write copy that answers the what, how, who, and why questions quickly and and gets you booking more of your ideal clients, come join us in the free email course, Wellness Websites 101. The e-course is geared specifically towards wellness businesses, using techniques that I have applied with my one on one clients as well as my copywriting students. It only takes a week to go through the course and you'll be able to outline the copy for all of the main pages of your website, and connect with other professionals in the free Facebook group with the E course. To join us go ahead and plug in your email and name below and click the red button!